In the race to produce a quantum computer, a number of projects are seeking a way to create quantum bits—or qubits—that are stable, meaning they are not much affected by changes in their environment. This normally needs highly nonlinear non-dissipative elements capable of functioning at very low temperatures. At EPFL's LPQM, this idea of a capacitor that's easy to make, less bulky and less prone to interference has been explored. 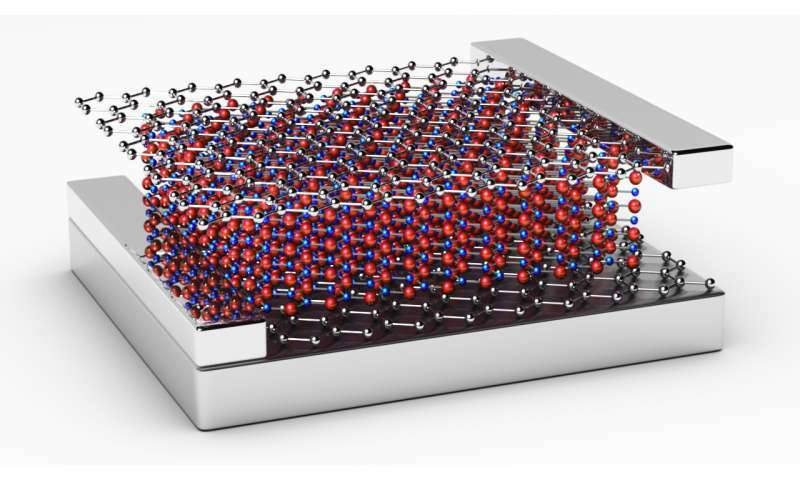 It consists of insulating boron nitride sandwiched between two graphene sheets. Thanks to this sandwich structure and graphene's unusual properties, the incoming charge is not proportional to the voltage that is generated. This nonlinearity is a necessary step in the process of generating quantum bits. This device could significantly improve the way quantum information is processed but there are also other potential applications too. It could be used to create very nonlinear high-frequency circuits—all the way up to the terahertz regime—or for mixers, amplifiers, and ultra strong coupling between photons.